Given the return of straight-leg jeans,platform boots, and even denim mini skirts, the return of bootcut jeans should come as no surprise. With its major wearability—the slight flare leg is an ultra-flattering cut—we’re beginning to wonder why it fell out of favor in the first place. Reintroduce the classic pant into your daily rotation with these tips from a few street style ladies and one chic Victoria’s Secret model. Bootcut jeans were once only worn by “cool-moms,” but that’s no longer the case. 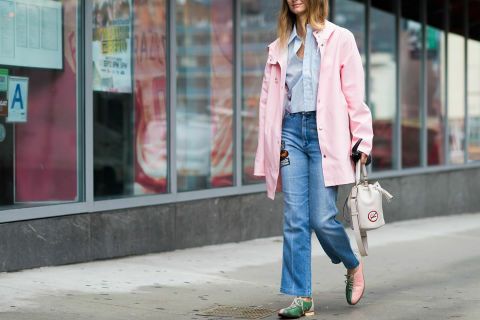 Try a patchwork style and wear them with a pink raincoat and playful oxfords for a cool off-duty look. Presenting the classic way to style the bootcut: Have your jacket fall right below the top of your jeans, elongating your stature. Pair them with ankle boots and a mini purse for a modern turn on early-2000s vibes. The most wonderful thing about bootcut jeans is that they’ll look good with practically anything. You already live in a bomber jacket and white tee, so pair them with cropped bootcut jeans and heels for a quick and easy look. If you’re feeling apprehensive about this “new” style, a monochromatic outfit, like this head-to-toe white one, takes the guess work out of what to pair with your jeans. Add some color with a headscarf and simple accessories. Fashion blogger Chiara Ferragni paired her jeans with even more ’90s throwbacks: a black crop top and choker necklace. Thanks to a sleek ponytail and that striped jacket she looked more modern, less Friends season 2. Flared sleeves mimic the slight flare of your denim, lending some interest to the overall silhouette of your outfit. Heels help lengthen your legs and keep you looking long and lean.